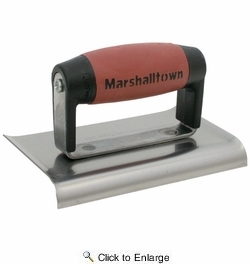 Made from carbon steel, with a sturdy mounting welded to the blade. Comfortable handle is securely attached. Used to produce a radius at the edge of a concrete slab to help prevent the edge from chipping off. Curved end helps prevent edger from digging into wet concrete.